We now turn to the addition of the text on our design. 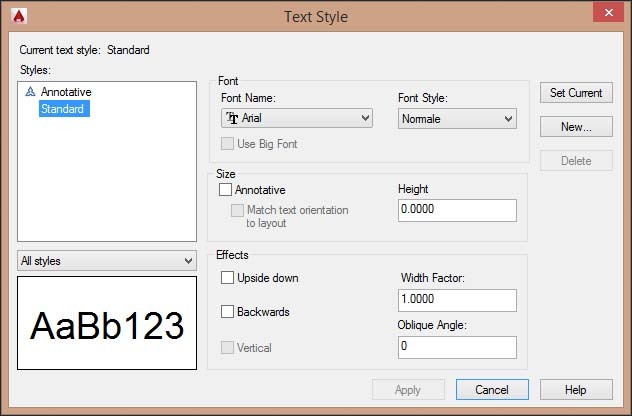 The first command to see is the "Text Style"
In AutoCAD, we can create in a drawing different text styles and for every text style, you can set a “font” of writing and other characteristics, in particular the height of the character. On top of this window find the “Styles” area where there are already created a text style called “Standard. If we click on “New” button, will open another window, where we’re going to type the name of the new style of text that we are creating, for example “style1”, then press “Ok”, we see that the “style1” is added to the styles area. We can now set the characteristics of this style in the “Font” area. We will see in the “Preview” area, an example of the font chosen. Once you select the dropdown "font name", you can also browse the selection with the arrows keys of the keyboard. The characters with the extension (Shx) belong to AutoCAD and are more simple in appearance, consisting of lines and can be exploded. Those with the symbol TT fonts are call “true type” and are part of windows, these has a better quality and full color. Some of the available characters are composed of symbols. Still on Font area, find “Font Style” (regular, italic, bold) and under this, there is another box, where you can set the height of the text. Once this is done, press “Apply” button, to make current the text style created and then press “Close”, to close the window. Once you set the text style, we are ready to enter the writing on the drawing. To do this, we have two different text commands on the toolbar or on the ribbon.